On this site you will find the best available rate online! If you find a room at a lower price, we'll beat it: we'll offer the same rate plus a further 10% off. 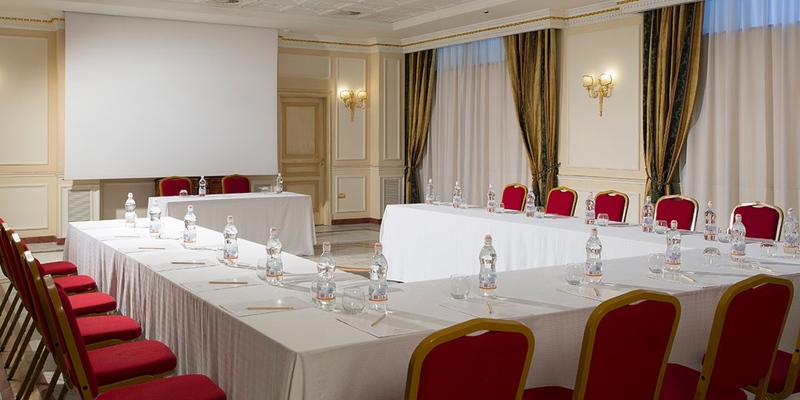 The conference centre of the Grand Hotel Vanvitelli is one of the major congress facilities in Campania for its spaciousness and location. The centre offers 16 meeting rooms that can be set up for any type of event related to business tourism, with the advantage of being just minutes from the A1 motorway junction, the South A.S.I. industrial area and the Tar exhibition centre, and only 15 minutes from the Naples Airport. Our conference centre has a total capacity of 1,500 seats, of which 500 alone in the hall Carlo III, organized in 16 fully equipped rooms for conferences and congresses. For small meetings, one of our *6 business rooms* can be booked, able to accommodate up to 35 participants. Thanks to the versatility of our spaces, we can accommodate events such as exhibitions and fashion shows. Moreover, we can set up the rooms to host gala dinners, prepared by our catering service. Add a coffee break or a lunch to include a pause in your business event, take advantage of our catering service. Contact the manager of the Business Office to make an appointment and come visit our premises. Would you prefer to be contacted by our manager?